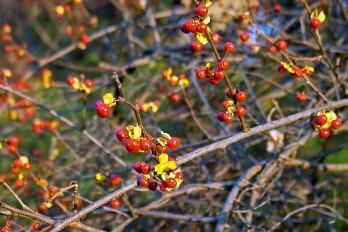 Invasive Oriental bittersweet (above) has fruit clusters along the vine at leaf axils. Native bittersweet has fruit clusters only at branch tips. An invasive species is a plant or animal that is not native (i.e., is exotic) to a particular ecosystem and has the potential to spread widely at the expense of native species. A single species can severely impact biodiversity and alter the ecosystem’s function. One of the Arboretum land care staff’s biggest tasks is management of invasive species in its prairies, oak savannas, woodlands, and wetlands. Over the years, settlement and cross-country migration introduced many exotic species—some of which turned out to be highly invasive—to North America. Among those that spread to and thrived in southern Wisconsin are: garlic mustard and wild parsnip, brought for human consumption; smooth brome and reed canary grass, for livestock forage; oriental bittersweet and common buckthorn, for their attractive ornamental qualities. Others, such as purple loosestrife and spotted knapweed, were introduced accidentally. With modernization and industrialized global transportation, invasive species like the emerald ash borer continue to arrive at an alarming rate—often unintentionally and undetected until they spread and cause extensive damage to native species. Many of these invasive species are now present on Arboretum lands. Emerald ash borer was confirmed at the Arboretum in 2017. The invasive “jumping” worm, Amynthas species, was discovered at the Arboretum in October 2014. In some cases they have caused significant reductions to native species populations, and even eliminated a few altogether. Arboretum land care staff and volunteers manage invasive species in several ways. The most common method is simply to pull a plant from the ground by hand. This works well for plants with a tap root. A spade or other hand tool can help pry out the root. For more extensive root systems cutting or mowing can be effective, although repeated cuttings during the growing season are often needed to kill the plant. Another approach is to remove the seeds of an invasive plant so they do not drop to the soil and germinate. Finally, Arboretum staff may treat invasives with herbicide, usually as a carefully targeted last resort when the other methods cannot be used effectively.